Cook the rice according to package directions with the coconut juice and vanilla leaves. Make two thing omeletes (recipe here) and shred. Combine with the other meat mixture ingredients. Heat the oil in a wok or large pan over medium-high heat. Add all the ingredients for the meat mixture. Stir-fry until everything is heated through, 4-5 minutes. Add the seasoning and cook for another minute. 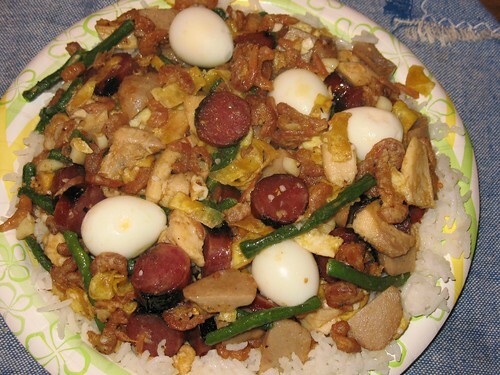 Place the quail eggs in the bottom of a rice bowl or mold. Add the meat mixture on top and press it down. Add the rice and press down again. Flip the bowl over to unmold and serve. My bowl was too big and I didn’t wait long enough before unmolding, so it didn’t stay together very well. This is what it should look like. If I were to make this again, I would cut the amount of dried shrimp in half. Too much salty shrimp for me. But everything tasted great. This is supposed to serve 4. Preheat a medium skillet over medium heat with 2 tbs olive oil. Add the onions, garlic, red pepper flakes, cumin salt and pepper. Cook, stirring occasionally for 3 – 5 minutes. While the onions are cooking, preheat another medium skillet over medium-high heat with the remaining olive oil. In a shallow dish, combine the juice of 1 lime, honey, chili powder, salt and pepper. Add the fish to the mixture and toss to coat. Add the seasoned fish to the hot skillet and cook until cooked through, about 3 to 5 minutes on each side. To the cooked onions, add the bell peppers and corn. Cook for 1 minute. Add the chicken stock and cook for another 2 minutes. Add the black beans and cook until they are heated through. Remove the pan from the heat and add the juice from the second lime, the cilantro and spinach. Toss to wilt the spinach and then taste to adjust seasoning. 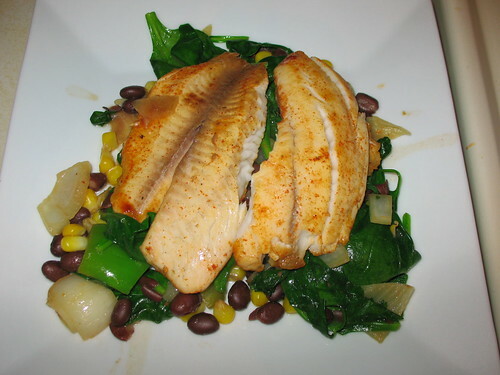 Dish the salad onto a plate and place the warm fish on top. See the just the salad here. The fish was decent, but the salad was awesome.